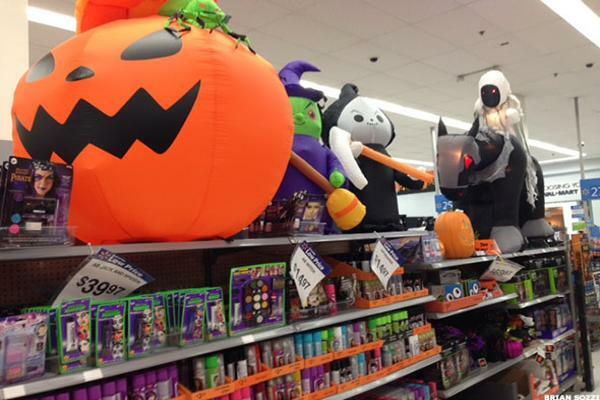 Halloween spending should hit a record this year. Total amount spent around the spooky season is forecast to reach a new high of $9.1 billion, with 179 million Americans planning to partake in Halloween festivities, up from 171 million in 2016, according to the National Retail Federation. In 2016, total spending hit $8.4 billion, another record at the time. Consumers are expected to spend an average of $86.1 each for Halloween, compared with last year’s $82.93. And shoppers plan to spend the most, or $3.4 billion, on costumes; $2.7 billion on candy; about $2.7 billion on decorations; and $410 million on Halloween-related greeting cards, NRF said. In search of Halloween-related goods, 47 percent of shoppers told NRF they will visit discount stores, while 38 percent said they will go to a specialty shop. Twenty-five percent of shoppers surveyed said they will visit supermarkets, 24 percent plan to go to department stores, and 22 percent are looking online for deals. “Halloween continues to be a highly anticipated holiday for Americans, who will spend a record amount this year with increases across all purchasing categories,” said Pam Goodfellow, an analyst with Prosper Insights. “Expect consumers to be on the lookout for early-bird promotions both online and in-store as they hunt for the best items to complete their costumes and embellish their homes,” she added.